Gasoline prices: The front-month futures price of reformulated blendstock for oxygenate blending (RBOB, the petroleum component of gasoline used in many parts of the country) rose by 10 cents per gallon (gal) from July 3, settling at $1.63/gal on August 3 (Figure 5). 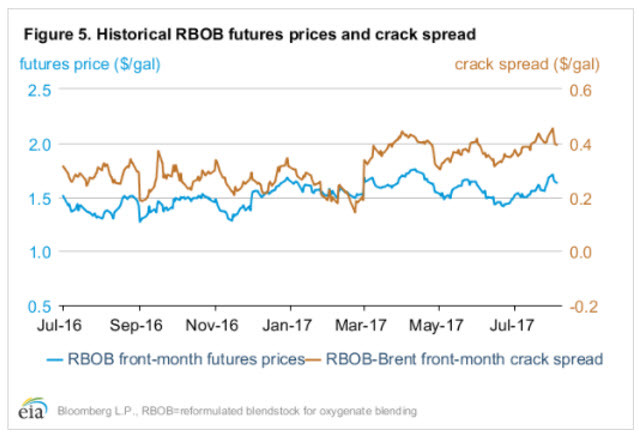 The RBOB-Brent crack spread (the difference between the price of RBOB and the price of Brent crude oil) rose by 4 cents/gal over the same period, settling at 39 cents/gal. The RBOB-Brent crack spread averaged 40 cents/gal in July, 12 cents/gal more than in July 2016. In the STEO forecast, EIA estimates that U.S. gasoline consumption reached a record high of 9.7 million barrels per day (b/d) in July. This estimate is supported by WPSR data that show average gasoline consumption for the four weeks ending July 28 was 9.8 million b/d. WPSR data also show finished gasoline exports for the four weeks ending July 28 were 0.6 million b/d, which, if confirmed in monthly data, would be a record high for July because of continued demand from Mexico and South America, among others. 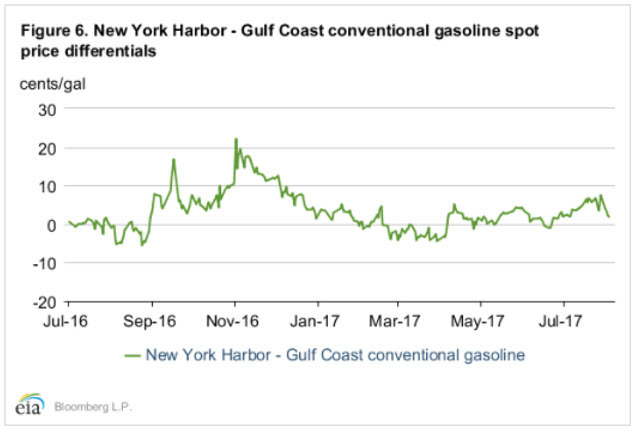 Regional gasoline prices: The price premium of New York Harbor gasoline over Gulf Coast gasoline reached a seven-month high toward the end of July (Figure 6). The relative strength in the New York market was in response to refinery outages that occurred during a period of low gasoline imports and low receipts of gasoline from the U.S. Gulf Coast compared with typical levels, which contributed to declining gasoline stocks in Petroleum Administration for Defense District (PADD) 1 (U.S. East Coast). Some gasoline production on the U.S. East Coast may have been curtailed because of operational issues at refineries in Philadelphia and Delaware City in recent weeks. WPSR estimates of total gasoline imports into the U.S. East Coast for July were close to or below the five-year low. Further, gasoline movements from the U.S. Gulf Coast to the U.S. East Coast were reported to be lower than usual. In June, shipments of gasoline through the Colonial pipeline, which runs from the U.S. Gulf Coast to New York Harbor, were reported to fall below capacity for the first time in almost six years. With refinery issues as well as lower imports and regional movements, total gasoline stocks in PADD 1B, which includes the New York Harbor region, have been declining since April and are close to the five-year average for July, according to the WPSR. In contrast, gasoline stocks on the U.S. Gulf Coast reached a record high for the month of July. The higher price premium for New York Harbor gasoline may begin to attract gasoline shipments into the region in the coming weeks. Ultra-low sulfur diesel prices: The ultra-low sulfur diesel (ULSD) futures price rose by 13 cents/gal from July 3, settling at $1.64/gal on August 3. The ULSD-Brent crack spread (the difference between the price of ULSD and the price of Brent crude oil) rose by 7 cents/gal, settling at 40 cents/gal (Figure 7). 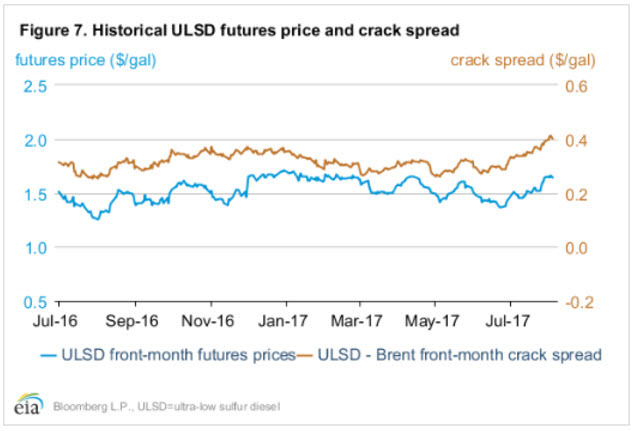 On August 2, the ULSD-Brent crack spread reached the highest point since September 2015. According to the WPSR, distillate consumption reached 4.2 million b/d in July. That level is closer to the consumption levels seen during the peak U.S. home heating season in the winter months, and if confirmed in the monthly data, it would be a record high for July. Continued increases in U.S. industrial production, manufacturing activity, and freight shipments are likely contributing to increased domestic consumption of distillate. In addition, the Petroleum Supply Monthly shows that distillate exports reached a record high of 1.5 million b/d in May.